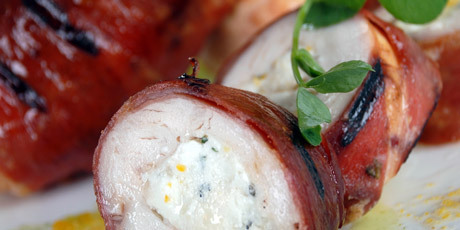 Juicy goat cheese stuffed chicken wrapped in crisp prosciutto. 1. In a medium bowl, mix together goat cheese, oregano, lemon zest, maple syrup and pepper until well combined. To prepare chicken, make a horizontal cut in chicken breast to create a pocket about 1 inch (1.5cm) wide. Be careful not to cut through the other side of the meat. Stuff each chicken pocket with the mixture. Sprinkle the outside of chicken with pepper. 2. Wrap 2 pieces of Prosciutto around each chicken breast. Make sure the bacon is secure. Wrap each chicken breast tightly in plastic wrap. Store stuffed chicken in the refrigerator to set up for 20-30 minutes. Preheat grill for medium indirect heat 350°F (176°C). Leave one burner turned off. Oil the grill to prevent sticking. 3. Remove plastic wrap from chicken. Drizzle olive oil over each chicken breast. Place the chicken on the grill. Grill the chicken for about 2-3 minutes. Frequently turn and move the breasts around the grill to cook Prosciutto evenly (without overly charring). Cook until Prosciutto is golden and crispy. Once the Prosciutto is crispy, move the chicken to the side of the barbeque with heat turned off. Close the barbeque lid, and continue to cook for 10-12 minutes or until chicken is cooked all the way through. Chicken is done when the juices run clear when poked with a fork. Remove chicken from the grill and let rest for 5 minutes. Do not tent the chicken with foil, or the Prosciutto crust will go soggy. Slice chicken into ½ inch portions.